LONG ISLAND, N.Y. -- A chaotic scene at a music festival on Long Island left two concertgoers hurt. 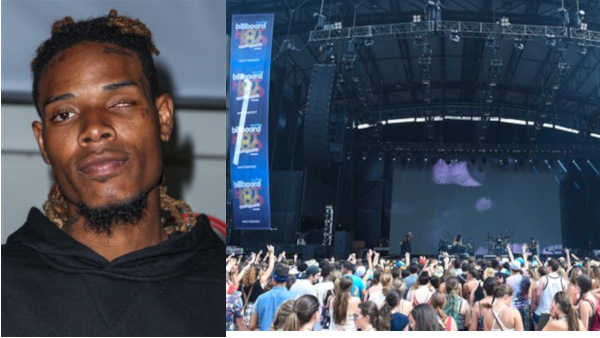 The incident happened this afternoon when rapper Fetty Wap was performing at the Jones Beach Theater. Two girls got trapped under a fence after the rapper jumped off the stage and into the audience, causing the crowd to rush the stage. The girls were not seriously hurt. Wap returned to the stage minutes later and apologized before continuing with the performance. Wap is one of two dozen artists performing at the Nikon at Jones Beach Theater. Others include Justin Bieber, Nicki Minaj and Lil Wayne. Representatives for Wap, whose real name is Freddy Maxwell, did not immediately respond to an email seeking comment.